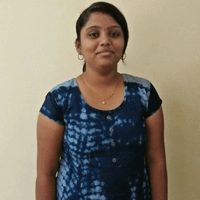 Uthra Devi now Research Associate, IPR in Quintiles IMS (Bangalore) world top healthcare company. Here I’m sharing the success story of one of our alumni Uthra. Monisha is science student and after her senior secondary and intermediate she decided to get into Chemistry field. She Qualified her B.Sc. in Chemistry from Auxilium college,TamilNadu. After that she qualified her M.Sc. in Pharmaceutical Chemistry from VIT University,TamilNadu with a merit scholarship and gold medal. Most Indian students I believe are straight arrows trying to search job after college if they are smart. If not just do what the society expects you to do. However there are cases of disenchantment and success after it. After her masters she joined online Job oriented Patent Analyst Training Program in IIPTA. Now she is successfully placed in Quintiles IMS (Bangalore) world top healthcare company, on the post of Research Associate with the package of 3 lakh per annum. Uthra has some advice for students looking for career path “Just go for IIPTA! Start getting involved as early as you can, and if you want to know more about it, they’re going to help you.” Uthra gives most of the credit of her success to her parents and IIPTA team who always remained very supportive. Here’s wishing her all the very best for his future endeavors.